When it come to fine art printing R. Mac Holbert along with Graham Nash started it all. If it was not for them fine art inkjet printing would not be what is today. Simply put Nash Editions is THE name in fine art printing and R. Mac Holbert is the talent behind that name. This DVD is the first of R. Holbert’s Nash Editions Master Class. This is a truly unique opportunity to have access to the knowledge of one of the pioneering innovators of digital imaging. Have you ever printed an image only to find you’ve overlooked a minor but critical mistake? Or have you made a small print, only to find a larger print shows issues that need to be fixed in Photoshop? 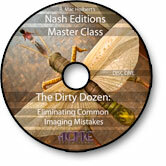 Whether you print your own images or send them to a service, this Nash Editions Master Class DVD is an invaluable lesson on eliminating twelve common imaging mistakes. Distilled from 18 years of printmaking experience these elementary mistakes are made routinely, not only by the neophyte, but by the seasoned professional as well. Learning to avoid them will save you time, printing costs and ultimately will enable you to more precisely realize your vision on paper. Learn how to correct contaminated neutrals with only one layer, doing the work of 4 -5 color correction layers. Learn how mid-tone contrast can add dimension to your images. Get these and other techniques on your workflow checklist, integrate them into your workflow and take your images from the ordinary to the extra-ordinary. Plus a bonus chapter on configuring Wacom Cintiq and 3 button mouse presets! lots of product and service are scattered here and there as well as making it proper uses above mentioned guidelines and the course of actions are very much effective. In order to make the precise uses of the prescribed form of the products above mentioned services are worth in all the way. In that case if anyone tries to deal with this master class product then its obvious that they could get the ultimate solutions of having a great deal of services in all the way. Thanks for sharing the information to all.